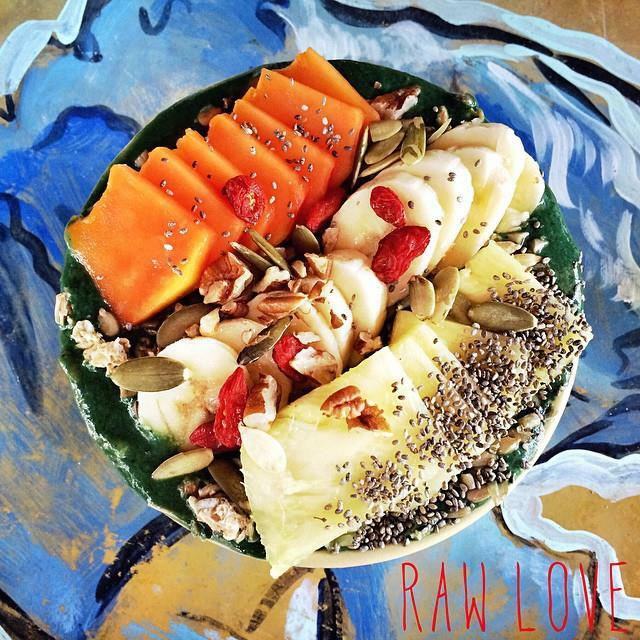 Whether you have been here as a retreat attendee, an Ahau guest, or have been lucky enough just stumble upon this the vegan dreamland known as Raw Love… you will know all about their divine smoothie “The Green Goddess”! Here we have the fabulous recipe for the world famous “Green Goddess” smoothie exclusively for you! With minimal peeling, chopping and fuss – place all of the following ingredients into your blender and whizz it all up for 1 minute until it’s smooth and velvety – gleaming with green goodness! This recipe contains 2 important superfoods that combined together bring you an excellent amount of protein. While moringa leaf is a non-sugar based energy booster, spirulina is rich in minerals and folic acid that allow for the body’s proper function. Spirulina’s weight is about 65% protein, listing it on top of almost any other vegetable in protein content. Moringa acts as a coagulant attaching itself to harmful bacteria and matter. Both have strong detoxifying, alkalizing and antioxidant effects that make this combination ideal for anyone interested in rejuvenating the body while ridding it of waste. Together with all of the fresh fruit, ginger, and spinach you are going to be feeling and looking like your true Goddess self before you you know it!